You are truly wealthy when you have been enriched by Life’s lessons – when you have gotten better and not bitter with Life’s experiences! Last evening, as part of the Madras Week celebrations, we had an opportunity to interact with Sowcar Janaki, the South-Indian superstar of the 50s and 60s. Janaki made her debut in 1949 in the Telugu film, opposite N.T.Rama Rao, Shavukar (the title means wealthy person; and its corrupt version in Tamil is Sowcar) – the film was a big hit, it was remade in Tamil, and she has since been known as Sowcar Janaki! Janaki, at 84 (she will be 85 this December; she shares her birthday with Rajnikant – December 12), oozes charm, is full of energy and is, simply, alive to the moment. 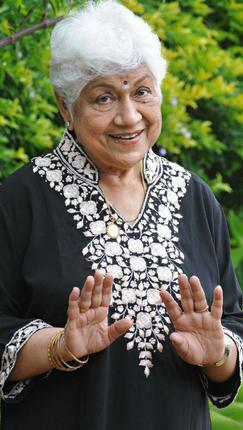 Her career spans 67 years and she’s still active – she’s currently shooting for a Telugu film in Hyderabad. Q: Has being a linguist (she knows several Indian languages and speaks impeccable English with a proper British accent) helped you through your career? A: Absolutely. But it is not about just knowing languages. It is about your willingness to learn. I am still learning. Q: Your immediate family did not allow you to join films when you were still unmarried. You proved everyone wrong by joining films after your child was born. What were the naysayers’ reactions to you after you became a star? A: Survival teaches you many things. Among them is the need to be true to yourself and not worry about what others have to say. I simply shut myself out to the opinions of others. I needed to join films because I needed to earn money to provide for my family. As long as I was doing what I was good at to be a bread-winner I did not see any value in considering what others had to say. Yes, they all flocked to me after I made it big. But by then my experiences had taught me how to not put down people while still keeping them at a distance. Q: How does a day in your Life look like? A: Why? (Laughs) I am just an ordinary human being. I work in films. Just as others work elsewhere. I learnt early on not to cling on to fame and name. I know one day you will be stripped off everything – your name, your fame, your money, your glory – all this will go. I cook. I potter around my garden. I don’t have anyone do anything for me that I can do myself. So I lead a fairly active day. I always count my blessings – fortunately at my age, I don’t have a sugar factory (diabetes) or an oil factory (cholesterol). And I have this audience in front of me. Aren’t these blessings? I consider myself very lucky! Her nickname may be Sowcaramma. But she’s wealthier than the most materially rich person in the world. Because she has the wealth of wisdom gained from a lifetime of experiences! If you internalize the essence each of her answers in the context of your Life, you too may just grow a wee bit richer than you already are! Achieving whatever you set your sights on takes time. The key to achievement, above all else, is patience. 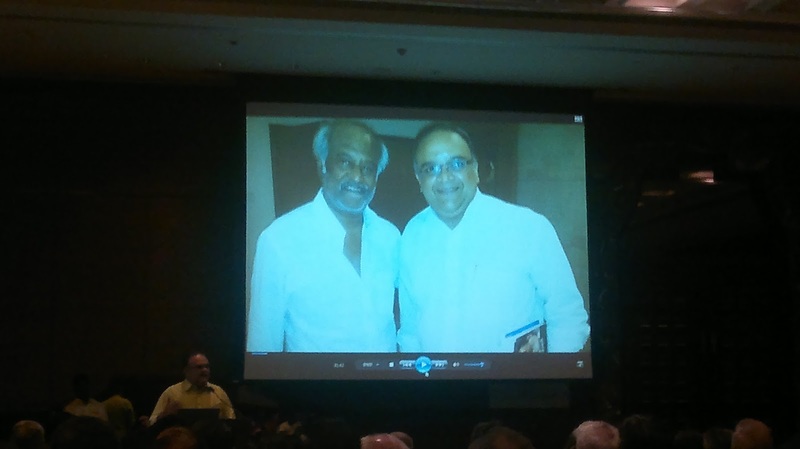 Yesterday we were at a Madras Week event where famed film critic and senior journalist Baradwaj Rangan was in conversation with Carnatic vocalist Sandeep Narayan, a disciple of renowned singer Sanjay Subrahmanyan. Sandeep was born in the US. He lived and grew up in Los Angeles for much of his Life until 1996, when he visited Chennai at the age of 11 to “touch and feel” the “world of Carnatic music at its Mecca”. Ever since, Sandeep was drawn to Chennai and kept visiting here in summers and winters (for the famous Madras Music season). He completed his undergrad law degree in 2006 in the US and has since made Chennai his home. Evidently, Sandeep’s Life journey has been unique – most people from Chennai move westward after their undergrad programs. But here is someone who was drawn to Chennai, and to Carnatic music, from the West. Obviously, he faced huge cultural barriers and challenges. For one, most sabhas and people who mattered in the Carnatic music circuit treated him as an NRI – although he has been living here from 2006. His strong American accent while speaking English did not help much. 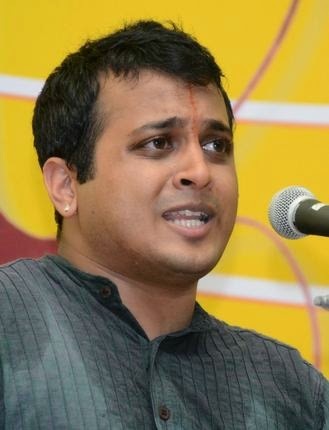 Then breaking through the politics that governs the Carnatic music scene has been difficult – and often times depressing, especially because Sandeep chose not to do “his PR” with the sabhas or play “politics”. “I just didn’t fit in doing those things,” he confessed. This really meant that there would be long spells – often months – when he would not get concerts to sing. But he was patient. He kept practising and kept attending every concert possible – to learn as much as he could. Then, slowly, people started offering him concerts. And now, in the last few years, he’s among the more sought after Carnatic musicians. I thought that was a very simple yet profound answer. At this point popular television and film actor, Mohan Raman, piped in from the audience to say: “I have been around for 25 years in my industry and I have learnt to deal with the unpredictable nature of securing projects by simply being happy with whatever I get!” Mohan is a wonderful artiste and has done several celebrated roles in Tamil cinema. Even so, his ability to accept whatever comes his way, offers a teachable perspective for us to learn from. Marrying both points of view – Sandeep’s and Mohan’s – I believe the best way to approach Life – and your business or career goals – is to keep doing your best and never get influenced by the outcomes. Life is a lot about being patient with what you want. I liked Sandeep’s attitude to invest the time he spent waiting for a break to practise being a better musician. And I like Mohan’s point that we must learn to be happy with what we get. Interestingly, when you are patient, you are actually demonstrating how much conviction you have in yourself and in all that you are pursuing. Most people want results instantly and get frustrated when things don’t work out despite their best efforts. This is where depression sets in and suffering takes over. Never let your frustration drive you. Be driven surely – but by your passion and your vision for yourself. When you are sure of the direction you have chosen in your Life and are patient – and happy – on the road, somewhere along the way, you do arrive at the destination that you were always destined to arrive at!